Here's What A $9,600 Comb Looks Like | OhGizmo! By David Ponce on 12/05/16 • Leave a comment! We’re rewritten these lines half a dozen times, trying to find the right way to quip about a €9000 ($9,600USD) comb, but… come on: a $9,600 comb?! The joke writes itself! 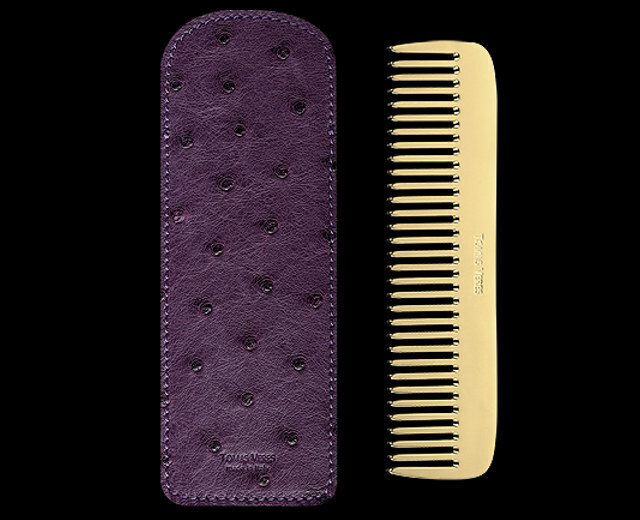 Yes, this is an actual item you can buy, a solid 14K gold comb that comes in a green, red, or purple ostrich carrying case. It’s made by Tomas Veres and comes in a limited edition of 800, because the good folks at Tomas Veres apparently believe there’s an 800-strong market for a comb that costs as much as a new car. And if you really want to get in on the action but can’t quite swing $10k, there’s a silver version for €1000 ($1,070USD).